Early Renaissance Painter Noted for Murals at San Marco Convent. Fra Angelico (angelic brother) was the popular name given to the major painter of the early Florentine Renaissance, Fra Giovanni da Fiesole, a Dominican friar. Devoted exclusively to Christian art, he employed his art for didactic purposes, and his signature style was simple and direct, though based on the largeness of form of Giotto (1267-1337) and Masaccio (1401-1428). A well known figure in Renaissance art, Fra Angelico is best-known for his series of more than 50 religious paintings on the Life and the Passion of Christ, which he painted at the convent of San Marco - mostly as an aid to contemplation in the friars' cells. He also frescoed the private chapel of Pope Nicholas V in the Vatican. Despite his status as a member of the Church, Fra Angelico was a highly professional painter who travelled extensively to execute a number of prestigious commissions, making a significant contribution to the Italian Renaissance during its early stages. In particular, he was responsible for sketching some of the greatest drawings of the Renaissance. Fra Angelico's real name was Guido di Pietro, and he was born in the Mugello a decade later than has been traditionally thought. Still a layman in 1417, he is not mentioned as Fra Giovanni until 1423. The young Angelico was proposed to a Florentine church guild in 1417 by Battista di Biagio Sanguigni, an illuminator of religious songbooks. His familiarity with a miniature-painting milieu probably included Lorenzo Monaco's school in the Camaldolese convent of S.Maria degli Angeli. This would explain the peculiar translucence and brilliance of his tempera style of painting. That Angelico himself worked as a miniaturist is confirmed by Giorgio Vasari in "Lives of the Artists" (1550); his hand has now been detected in at least one missal at S.Marco (c.1428-30) and in a single leaf of the Crucifixion at S.Trinita (1435-40). By 1418 he was already known for his panel-paintings. His early repertoire - conventional Gothic triptychs with predelle below - represents a synthesis of Sienese-influenced tradition (eg. Lorenzo Monaco), International Gothic intrusion (eg. Gentile da Fabriano), and quattrocento Florentine innovation (eg. Masaccio). A comparison between his first major surviving altarpiece (c 1424-5; S.Domenico, Fiesole) with the later San Pietro Martire triptych (1429; Museo di San Marco, Florence) shows that Masaccio's influence was decisive. By the 1430s Fra Angelico had arrived at his own unique style of religious art. 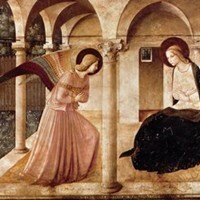 We recognize it in The Annunciation (c.1432, Museo Diocesano, Cortona). Here, volume reminiscent of Masaccio has been chastened into something more slender, but no less spacious, as in the proportions of the arcaded loggia which accommodates the Virgin and the vermilion-clad angel before her. To the same period belongs the Tabernacle commissioned by the Arte dei Linaiuoli, the guild of flax workers (1432; Museo di San Marco). Derived from the Madonna of Humility as evolved by Lorenzo Monaco and the gothic stylist Gentile da Fabriano (1370-1427), the type of the Linaiuoli Madonna was to appear in a whole series of devotional Madonnas of the utmost gentleness which Angelico and his workshop produced during the 1430S. Variants occur in the two polyptychs painted for Cortona (1435-6) and Perugia (1437), and in the central panel of a dismantled polyptych now in the Uffizi Gallery, Florence (c.1440). Aided by an increasingly productive workshop, Angelico, during these years, was working in the secluded Dominican Observant house at S.Domenico in Fiesole. He was, despite his growing reputation as an important contributor to Early Renaissance painting, preeminently a convent painter - according to Giorgio Vasari "most gentle and temperate, living chastely and removed from the cares of the world" - and it is this "medieval" reclusion which has led to him being considered as somehow reactionary. On the contrary: the works Angelico produced during the later 1430S were fundamentally innovative in composition, colour painting harmony, perspective, portraiture, and landscape. Progress in all these directions gained momentum in the decade following the removal of the Dominican Observants from Fiesole to the former Silvestrine convent of S.Marco in Florence (1436). Cosimo de' Medici, who instigated its reconstruction, commissioned Angelico to paint a major new altarpiece for the church's high altar (1438). The central panel (Museo di San Marco, Florence) - an enthroned Madonna, encircled by a meditative entourage of angels and saints - is full of novel features: the prototype of the typically Renaissance sacra conversazione. The panel is much damaged, and to form an impression of Angelico's tempera style at its most brilliant we must consider the Deposition he painted for the Strozzi Chapel in S.Trinita (1442-5; Museo di San Marco, Florence). Originally commissioned by Lorenzo Monaco (who completed the three pinnacles on top), the limitations of the panel's tripartite shape have been resolved by Angelico's unified figural composition. Unlike the almost contemporary Deposition by Rogier van der Weyden in the Prado, Madrid, Angelico's version has been given a spatial setting of unparalleled depth. It is as if a door has been flung open on the confined schemata of Florentine panel-painting and we have emerged into the real world. Its flowers are before us. And as we advance into the picture space, a majestic panorama unfolds before us: Jerusalem on one side, dominated by its ziggurat-like Temple of Solomon, and on the other, the hills of Tuscany receding, with the most fastidious gradations of light, into haziness. Angelico shows equal lucidity in his variation of colour: delicate mutations preponderantly of pink, vermilion, lilac, and blue reinforce the spatial construction. But Fra Angelico's major contribution to Early Renaissance art comprises his series of fresco paintings for the convent of San Marco (most completed 1440-5). They fall into two groups: those for communal contemplation (of which the Annunciation, at the top of the stairs leading to the upper corridor, is again set in an arcaded loggia), and those for private meditation in the individual cells (among these the Noli Me Tangere, the Coronation of the Virgin, and the Transfiguration are especially beautiful). At the call of Pope Eugenius IV, Angelico left Florence for Rome (c.1445), where, in the Vatican Palace, he decorated the Cappella del Sacramento with scenes from the Life of Christ. These were destroyed by Paul III in the following century. On the death of Eugenius IV, Pope Nicholas V commissioned Fra Angelico to decorate his own small private chapel in the Vatican. It survives intact (1447-48). Angelico's frescoes - richer in style than those in S.Marco - form an ensemble. Narrative scenes in magnificent architectural settings, from the lives of St Stephen (upper lunettes) and St Lawrence (lower rectangles), are flanked by eight full-length Doctors of the Church (on the lateral pilasters). On the ceiling are the Four Evangelists; the embrasures of the two windows are decorated with alternating prophet heads and rosettes; the lower wall surfaces are painted with a green textile design. Documents show that Angelico did not produce this alone: in May 1447 his workshop included Benozzo Gozzoli and four other assistants. But the speed at which he worked, despite studio assistance, is remarkable. In the summer of 1447 he painted frescoes on part of the ceiling of the Capella di S.Brizio in Orvieto Cathedral. In 1449 he began, and apparently completed, the decoration of the study of Pope Nicholas V (now lost). Fra Angelico left Rome at the end of 1449. In the following year he succeeded his brother as Prior of S.Domenico in Fiesole. After serving his term, he returned to Rome, where he died in February 1455. He is buried in the Dominican Church of S. Maria sopra Minerva. It was Giorgio Vasari (1511-74) who popularized the nickname "Angelico" in his "Lives of the Artists" (1550), saying it was the name by which the painter was always known. Another nickname used was "Beato Angelico", meaning the "blessed Angelico", and indeed he was beatified by the Vatican in 1984. Paintings by Fra Angelico can be seen in some of the best art museums around the world.